"When my doctor told me to eliminate salt from my diet, I thought I would never eat another egg again! But the chives and curry powder in this recipe pack the right amount of punch and add even more flavor to eggs than salt ever did." I made this and it was missing a kick. so i made it with a little bit more curry and a tap of franks red hot sauce and it gave it just the kick it needed. "Eggcellent" Lorraine! Love curry, love eggs (used Eggbeaters) and I loved this recipe. Thanks so much! This was a nice change from your every day scrambled eggs. I added some red onion on top but only because I like raw onion on most everything. These are very good. A simple way to jazz up scrambled eggs and a good way to use some of the season's first chives from my herb garden! 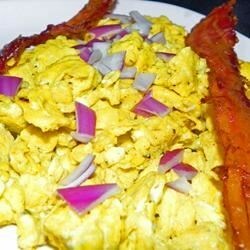 This is a scrumptious twist on scrambled eggs. I love it! The only thing I do differently is cook it all in coconut oil instead of olive. Delicious any time of day. curry is best left for dinner.